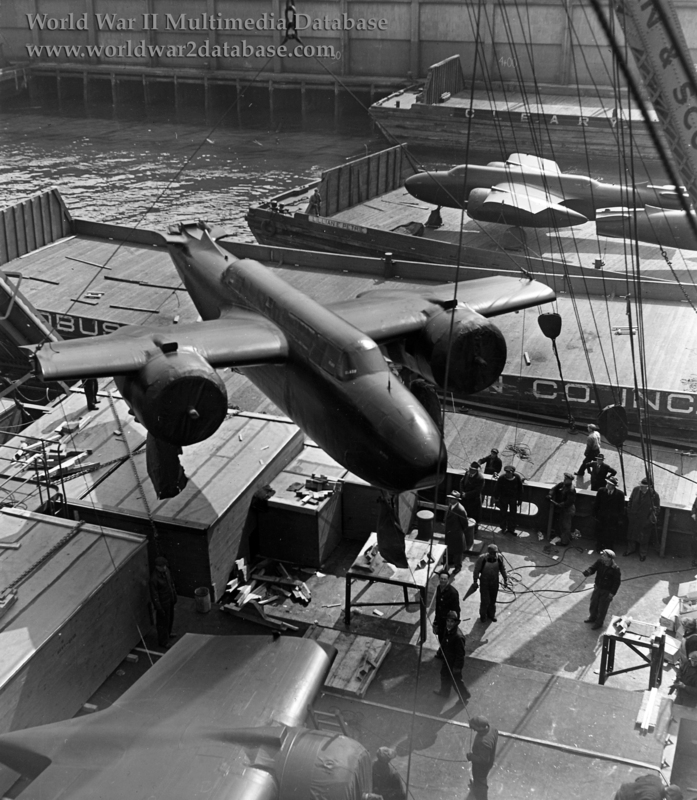 American-built Douglas A-20C Havocs are loaded onto a cargo ship for transport to the Soviet Union. They were welded to the deck to prevent loss in heavy seas. The scow with two planes on it, the Lillian E. Petrie, was damaged in an accident Long Island in November 1943. The crane was operated by Merritt-Chapman & Scott, one of the largest American marine salvage and construction firms. The Cleary Brothers ran scows around the East Coast for decades. While the Arctic Convoys were more dangerous and captured the public's attention, much more supplies were sent through Iran and across the Pacific. Ships carrying Lend-Lease supplies would transit from New York, New York to Capetown, South Africa and terminate in Bandar Shahpur, Iran or Basra, Iraq. In 1941-1942 most supplies went through the North Sea, because the Soviets did not want a large Anglo-American presence on their border. It took time to develop the "Persian Corridor" to receive substantial supplies, because only one dock in each terminus could handle large ships and the Tehran-Soviet railways lacked capacity. The railway from Bandar Shahpur to Tehran and then the Soviet Union was light rail through mountains. As late as 1944 supplies ordered (and delivered) in 1942 were still waiting for transit to the Soviet Union. The British took over the railroad, but the delivery of rolling stock and engines from the United States was delayed. The Americans took over the administration of the Persian Corridor in 1944, when their industrial output was reaching its zenith. By July, the peak month of deliveries, 282,097 long tons (286623.8 metric tons) came through the Persian Corridor. 2,771 A-20s were delivered to the Soviet Union through Lend-Lease. The A-20C was an attempt to standardize British and American versions. Developed for foreign markets, it was designated the A-20C by the United States Army Air Force and the Boston IIIA by the United Kingdom's Royal Air Force. Douglas built 808 at their Santa Monica plant and Boeing Aircraft built 140 A-20Cs under license. Much of the Lend-Lease order for the United Kingdom was sent to the Soviet Union. When the United States entered the war, they took over many A-20Cs to start training; the Americans rarely, if ever, used the C model in combat. However, because the variant could carry a torpedo, it was effective as a surface raider with the Soviet Air Force. This photo was released for publication in February 1943.